The transformation of the U.S. healthcare industry has meant big changes in way the healthcare providers market themselves. This evolving industry landscape has not only produced new programs and regulations; it also means that consumers now have new set of expectations from their healthcare providers. To create these types of campaigns, hospitals and healthcare providers are now working with marketing service providers who can craft and deliver the right message to this new breed of healthcare consumer. 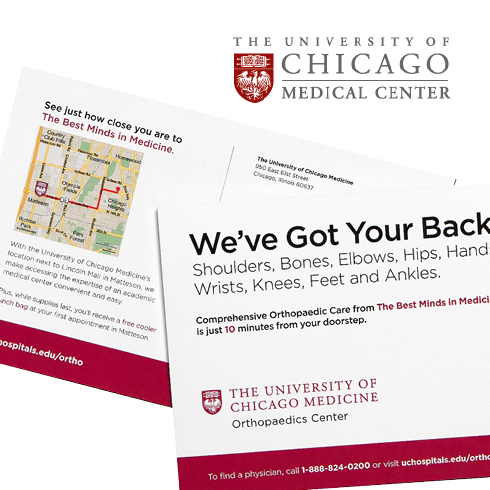 A campaign done for The Orthopedics Center at the University of Chicago Medical Center (UCMC) is an example of this type of marketing effort. The UCMC had recently opened a new orthopedics practice in suburban Chicago. Doctors at this new practice could provide the same world-class care that patients received at the main center, but without having to drive the longer distance into Chicago. To promote this new practice, marketers at the UCMC worked with direct mail provider Rider Dickenson to create a campaign targeted at households in towns within a specific distance of the new clinic. Each direct mail piece included personalized map that showed recipient exactly where the facility is in relation to his or her home with a route line. The mailer also included a personalized headline and copy that details the distance in minutes to the clinic. Are you interested in healthcare marketing? Read more blog pieces about the topic or read the full UCMC case study and other success stories!